What do we need to bring along on the tours? We recommend that you bring along a towel, sunglasses, water bottle, camera (to capture your amazing moments), sunscreen, hat, rain jacket in case the weather turns nasty, change of clothes for the wineries, some cash or a credit card for any purchases you want to make, a small backpack or bag to carry your belongings and of course your adventurous spirit and sense of fun and humour. Is there a set itinerary for the tours? We don’t operate with a fully set itinerary for our tours as we like to keep things fresh and tailor as much of the day as we can to suit the needs of our guests. The best adventures never really run to script anyway! Each tour has its particular adventure activities which won’t change but the duration and intensity will vary depending on the group. The wineries, breweries and gourmet producers that we visit are highly flexible and Paul will discuss this with you whilst enjoying the activity. Is Mojo the Surf N’ Dirt dog allowed to join us? Mojo is our border collie dog that loves joining in the fun on our Margaret River Kayaking and Winery Tours. He is unfortunately not allowed into the national parks for our other tours. If you would like Mojo to guide you down the river then please just request his services! How many wineries do we visit on the tour? The Margaret River Lifestyle Tour concludes the day at a winery where you can enjoy a relaxed wine tasting whilst enjoying each other’s company and toasting the fun day out that you’ve had. Our Margaret River Kayaking and Winery Tour will visit a selection of boutique wineries. We will also visit Temper Temper Chocolate and Vasse Virgin Olive Oil if you request it. Lunch consists of fresh bread, cold sliced meats, cheese, sandwich toppings and a few yummy salads and fresh fruit. This is a very wholesome and filling meal, set amongst a stunning backdrop. No one will walk away unsatisfied! Please advise us of any dietary requirements in the days leading up to your tour so that we can prepare and accommodate you. Do you cater for Vegetarians or Vegans? Yes, if we are notified in the lead up to the tour then we can happily cater for Vegetarians and Vegans. Gluten free meals can also be arranged. How fit do you need to be to go on the tours? The Live the Lifestyle and Kayaking tours are for all types of fitness levels. The mountain biking trails that we ride are a lot of fun for all levels of riders and don’t require you to be super-fit. We incorporate plenty of breaks to admire the scenery and to hear Paul’s stories on the local history of the area. You will however need to be fairly comfortable and confident on a bike. If you can ride a bike on the road then you will be fine! Will I be safe on the tour? All of our tours are designed with your safety first and foremost in mind. Keeping you safe and happy is our number one priority and is something that we take very seriously. Paul is trained in first aid and surf rescue techniques and also has a sat phone and first aid kit with him at all times. Paul will provide you with instructions on how to enjoy the activities as safely as possible and will be there looking out for you the entire day. All of our equipment is of a high quality and is regularly maintained. You are provided with an Australian safety standards approved cycling helmet for the mountain biking and an Australian safety standard approved life-jacket for the kayaking. Will I get wet on the kayaks or dirty on the mountain bikes? The double kayaks that we use are incredibly stable and it is almost impossible to tip them over unless you are trying to purposely do so. You may get a little bit wet from water dripping off your paddles but it is all part of the fun really. You will only get dirty whilst mountain biking if the trails that we are riding on are wet. If these conditions present itself then it’s all part of the fun too. Bringing a towel along and a change of clothes to slip into before visiting the wineries is recommended. You won’t need any experience with kayaking or surfing to come along and enjoy the tours. We can cater for all levels, from complete beginners to the experienced. For the tours that involve mountain biking you will need to be comfortable and confident with riding a bike. The terrain that we ride is mostly downhill but the tracks can be tight and there are a few small log jumps and obstacles to enjoy. If you have any concerns then feel free to contact Paul for more information. Our tours are a great day out for the family and kids have an absolute blast on them. For the surfing lessons we prefer kids to be over the age of 6. There are no age restrictions on the kayaking tours. For the mountain bike tours children’s bikes are not used. The seats on our small framed bikes are usually fine for kids over the age of 12 to ride. Kids are welcome to participate on the mountain biking tours as long as they are comfortable and confident with riding a bike on the road and can fit on a small adults bike. If you have any queries then feel free to contact us. Do the bikes have flat or clipless pedals? All of our bikes come equipped with flat pedals. Can I bring my own mountain bike? You certainly can! As long as it is maintained and in good working order. Please let us know in advance. I am a competent surfer. Can I bring my own board and wetsuit along? Yes, you can bring your own board and wetsuit along and you can surf it as you like at the beach that we take you to. Will you have water available on the tour? We will provide you with bottled water throughout the tour to keep you properly hydrated. What equipment are we provided with? Surfing: You are provided with a wetsuit, and a soft top beginner surfboard. Kayaking: You are provided with a lifejacket and a double sit on top kayak. Mountain Biking: You are provided with a helmet, gloves and a Giant Talon 27.5 Mountain Bike. Please bring along some comfortable clothes and a good pair of enclosed footwear (runners or trainers) for the mountain biking. For the kayaking it is ideal to wear something that you don’t mind getting a little wet. Having a change of clothes for afterwards is also recommended. Do your tours have a minimum number of people that need to be booked to run? Our Margaret River Lifestyle Tour and Margaret River Kayaking and Winery Tours have no minimum numbers of bookings in order to run as per usual. Both the ‘Great Escape’ Surfing and Mountain Biking Tours have a minimum requirement of four guests. I am on my own. Can you take just ONE PERSON on tour? You are more than welcome to come along on one of our tours on your own. You will meet and make friends with other people who are on the tour. If it turns out that it is just yourself who is booked for that day then Paul will communicate that with you and will try to make other arrangements. I have people traveling with me who aren’t very active. Is it ok for them to just join us for the wine tour after the adventure activity? Yes, as long as there are seats available it is no problem to pick your traveling companions up after we’ve enjoyed the adventure activity and are on our way to the first winery. Feel free to contact us and we will arrange a special price. What happens if it is wet and windy? At Surf N’ Dirt Adventure Tours we believe that each day offers the opportunity for fun and adventure no matter the weather conditions. Your safety is always our number one priority though so in circumstances where the conditions are deemed to be too dangerous then we will have no choice but to cancel the adventure activity part of the tour. We can always take you to the caves or head off on a winery or brewery tour but if that doesn’t suit your needs then we will try to accommodate you on another day. If we are provided enough notice we are generally quite flexible and happy to re-book your tour for another day, subject to availability. Feel free to contact us if any issues come up and we will try our hardest to accommodate you. When do you need to pay for the tour? You can pay directly on the day of your tour by cash or in advance through a direct transfer. If we haven’t answered your particular question above then feel free to contact us. 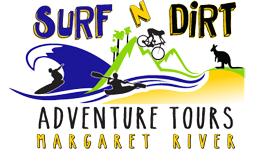 At Surf N Dirt Adventure Tours we are always happy to provide more information and answer any queries that you might have regarding any of our adventures or anything to do with your time in Margaret River. Email: info@surfndirtadventuretours.com.au any time of the day. Since we spend most of our time having adventures in remote locations there is often limited phone coverage, so we may not be able to answer your call straight away. Your call is important to us though so please leave a detailed message and we will answer your requests as soon as we possibly can!